Is a heat resistant plasters based material with controlled expansion, mainly used to pour low melting point’s metals and alloys (aluminum, zinc, tin, silver) by the “lost wax” procedure if the melting point is not over 800°C. After 24 hrs setting and using a rate of 35 cc water with 100g powder is 100 Kg/cm2. The setting expansion is 0.6% linear and the thermal expansion that is produced with temperatures over 700°C is around 0.9% linear. The total expansion is 1.5%, this counter attacks the contraction suffered by metal and alloys when they are poured. Approximately, the particle’s size is 60 micron. The investment has optimal granulometric distribution for great detail and smoothness. 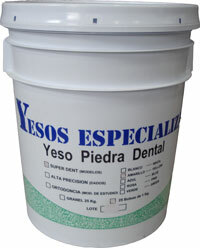 Polyethylene’s container with hermetic seal containing 25 Kg. 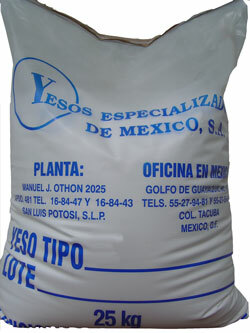 Polyethylene’s bag containing 25 Kg. 10 Polyethylene’s Bags containing 1 Kg, packed in card box. It is made in white. The main use is for the shoes, automotives and dental industries.